There are many milestone years in marriage. The first year you are on your honeymoon, number two you are trying to adjust to him just being there all the time. The shocking realization that there is another person up in your business takes some adapting and rearranging. I have read that year number three is the smoothest of the first five. They (who are they?) say if a couple makes it through number seven, their chances of a lasting, happy union are good. The odds are in their favor. Some have said that those still married by year forty, feel like honeymooners. 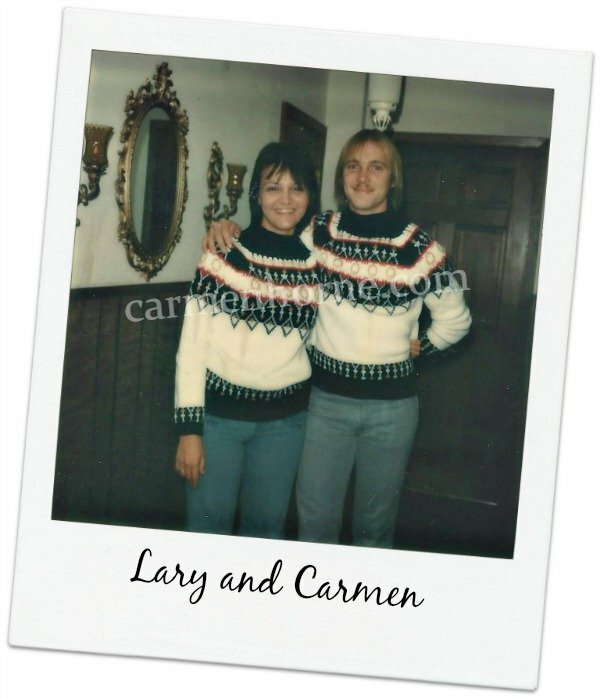 Lary and I have been married thirty-seven. I will let you know if we begin to wear matching shirts again. Smitten comes in the form of nursing during sickness, making a home together, caring for our kids and…aging parents, holding hands, greeting and leaving with a kiss. It may look like him plugging in your phone tonight or you adding cologne before bed. Smitten becomes deeper and more beautiful when you have weathered storms, wondered if you would make it and fought like the dickens for your marriage. As I have listened, cried with and loved on many who are struggling in their marriage, I haven’t seen many that looked like the latest romance novel or movie. What is truly exciting and romantic is seeing two people who are committed hang in there when it gets tough. Realizing that when we don’t feel it, we “still do”. Oh the look in the eyes of sweethearts who have some history, know the worst about each other but still long for each other when it’s all said and done. Let me encourage you today to work on the messy, beautiful, hard, amazing life you have together. Grit your teeth, back your ears and hold on tight…to your honey’s hand. Let’s all make it past that forty year mark. Living in that honeymoon period again will be priceless and may include a shopping trip for a couple of sweaters. Thank you for the serious marriage encouragement. You speak such wisdom. I think the most powerful thing about marriage is knowing that we will always be there for each other. There is power in commitment. Keep speaking life Carmen. Your words are so important. Cheering you on from the #RaRalinkup on Purposeful Faith. Oh yes Kelly, “There is power in commitment.” There may be times in our marriage that’s all we feel we have. Thanks for stopping by dear cheerleader in the faith! I wholeheartedly agree, Carmen. The struggles of life can either rip you apart as a couple or draw you together in an incredible bong–being “smitten” as you have said. I think what makes the difference is when we allow God to be the glue that pulls our broken hearts together. I would have never thought you were old enough to be married 37 years! You must have married very young, right? Love the pic of you two! Beth thank you for your find words. I was married young – sixteen :) And after all these years, I am still smitten with that fella of mine. We’ve been married either 7 years – or 70 – I always forget which. Yesterday I came home to a sink with no dirty dishes, a trashcan with no dirty trash and a cleanly shaved face. Ah Angela, you brought a chuckle. “7 or 70” was just funny. Girl, those gifts from your fella were a treat. He scored some brownie points. Hi Carmen! Thank you so much for this beautiful post! 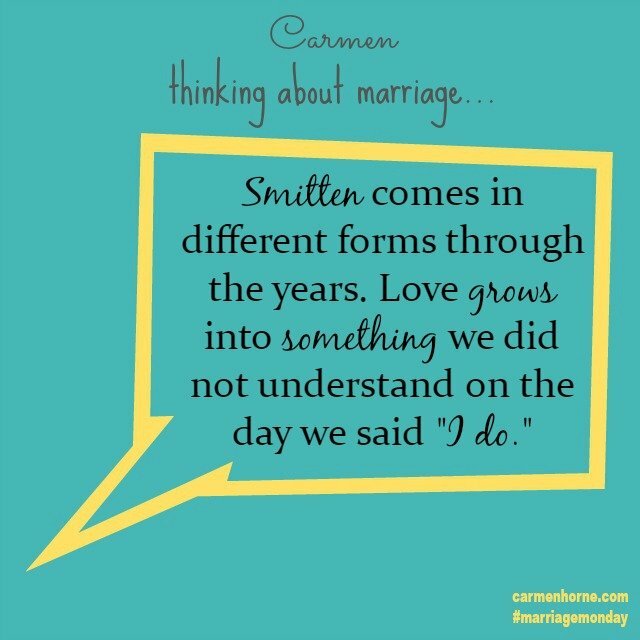 Me and my hubs have been married for almost 28 years and were high school sweethearts so I can whole-heartedly agree that “Smitten comes in different forms through the years” Blessings to you! Yes ma’am Danise. Sometimes (after many years) we forget what smitten looks like. Glad you stopped by. I loved so many things about this post, Carmen but this —> “Realizing that when we don’t feel it, we “still do”.” That commitment and resolve to keep loving and moving forward even when the days are hard, when the storms come, and when you still wonder why he is there all the time. ;) After 15 years of marriage I agree that it truly does get better every single day and the honeymoon phase has nothing on the lessons that are knit together in a three-fold cord, trusting Him and believing in love. Blessed to stop by from the #raralinkup. Well put Tiffany. Love that visual of the three-fold cord. Thanks for for stopping by.